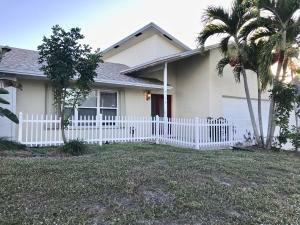 Spacious home in one of the the most desirable neighborhoods in Jupiter, Stable and safe, this neighborhood is bounded to the north by State and Federal lands that will prevent further development . Only 5 minutes to the beach, shopping and schools. No crowds and life is easy east of I-95. This home was just completely remodeled, with new Italian tile throughout, a new kitchen, baths, doors and more. Just bring your toothbrush. One of the largest homes in the area, fully 1,955 square feet under air and with a huge oversized 2+ car garage with room to spare. Quiet street, only a 5 minute walk to public access to the Loxahatchee River with a small beach where you can launch your canoe/kayak/SUP, fish, dive, and tie up or anchor your boat. Come and check it out, same day showings. Thanks! If you would like more information about listing MLS# RX-10495970 located in Jupiter FL 33469 or any other properties in Jupiter, please contact us at 561.676.8886 or click here to request additional information.